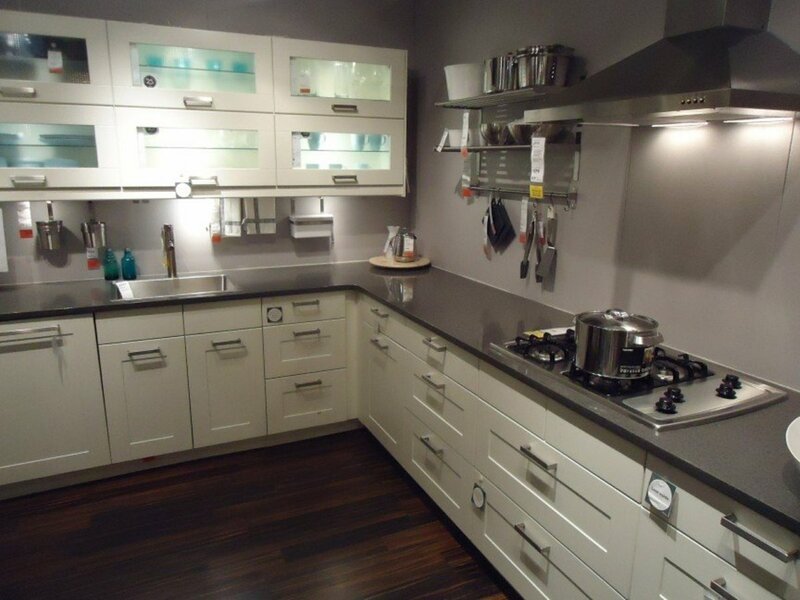 Most people with smaller pantries have considerable trouble with storage ideas or solutions. There just isn't enough room! A can storage rack for canned foods can be a lifesaver in more ways than one. With space always at a premium many pantries eventually degenerate into simple piles of cans or other goods with no particular rhyme or reason. This not only makes it very difficult to find what is needed, but also very often results in canned food sitting in a corner unused, sometimes for years past the expiration date—never a good option in a pantry. Some kind of method is needed to ensure that the oldest foods are used first, and that is the FIFO method of storage. 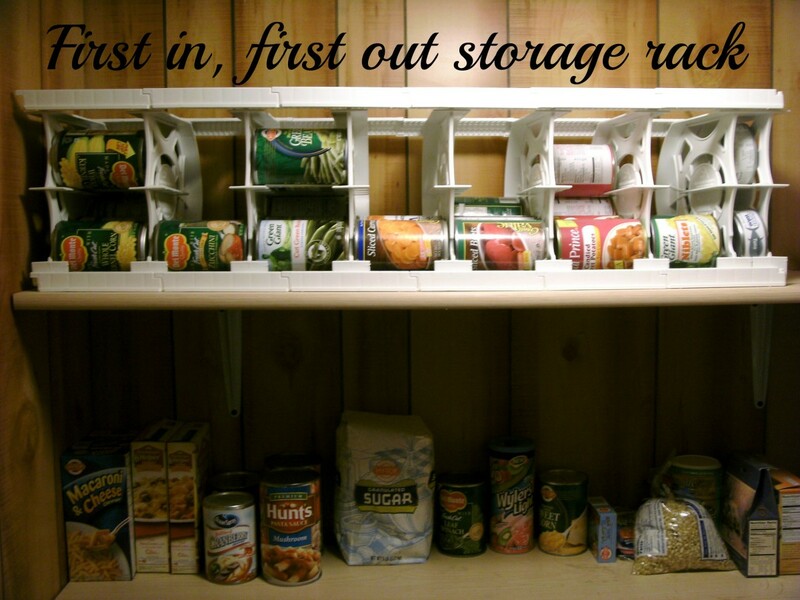 By making sure that canned food is rotated, the FIFO type of storage racks can literally be a lifesaver. FIFO stands for First In First Out and assures that the first can put into the storage rack will also be the first one used. Later additions will be used in turn, preventing any single can from sitting unused for long periods. Without this concept, pantry storage solutions might as well be the box brought home from the grocery store—they are virtually worthless. All of the storage racks presented here are of the FIFO variety; make sure that any storage solution used in the pantry results in rotation of stored items as these can storage racks do. The photo above shows such a rack; canned goods are inserted in the top of each section, roll back and down until coming to the front at the bottom where they are removed as needed. This particular rack can be assembled with different widths of cans in mind; the right hand section was configured for tuna fish cans, while the next section is for soup cans or shorter vegetable cans. Each section holds six regular-sized cans of vegetables, for a total of about 48 cans of food. Although the pantry in the photo was custom designed and built during a home remodel project, the pantry still needed some kind of canned food storage system, and the rack shown fit the bill perfectly. Cansolidator makes a product very similar to the one pictured above, and in several different sizes. Most of CanSolidator's products measure 16 ½" deep, which is probably too deep for an upper cabinet. They must either be used in a lower cabinet (usually deep enough) or on a pantry shelf. Make sure that there is enough depth in the intended storage spot to fit this product. These offerings are of the type that can be assembled (no tools required) to fit different sizes of cans. They are stackable or can be expanded to either side as necessary. Loaded and emptied from the front they are convenient to use and very strong and durable. The rack pictured at the top of this article has been in use for over a decade with no damage at all. These can racks are slightly shallower than the Cansolidator racks above, but not by much. Although advertised as holding "up to" different numbers of cans, it is doubtful that they will actually hold that many unless they are small soup cans or such things as pet food or tuna cans. Again made out of plastic, these racks can be expected to be used for many years without any trouble. On the plus side, the width of the individual sections is selectable within a wide range, making it more suitable for many homes. They are presented as an option solely because of their smaller size; they will fit where the larger rack above will not. There are several metal mesh can storage racks available as well, and these racks are often much larger than their plastic counterparts. Often not a true FIFO concept, these racks often needed loaded from the rear or top. 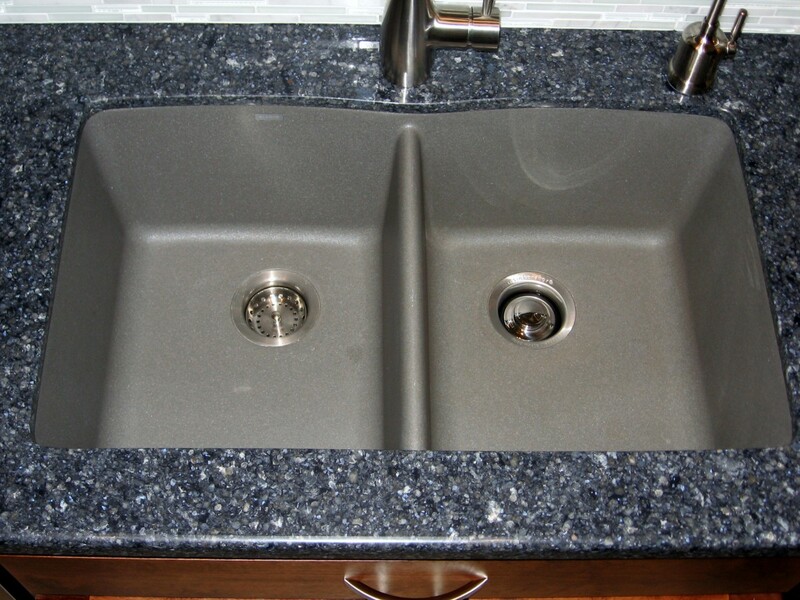 Make sure that space is available for this, or be prepared to completely empty each section before refilling it. These racks also often do not have customizable widths for different sizes of cans; if this is important consider one of the plastic models or make sure that the metal model chosen has this feature. One model in particular is for soda cans only; although it will work well for the purpose, other cans (except possibly soup cans) will not fit. I have used the rack shown here for soda cans with good success, but it won't work well for anything else. It was chosen because unlike many of the metal racks it is filled from the front; although the picture shows only 5 cans in it, the rack will hold 12, with another row on top of the one pictured. Can you get the side panels for the FIFO can storage? As far as I know, no. I've never found individual pieces for sale. @ Rhonda: although we have a small pantry now, it still needs to be neat and organized. These FIFO racks are the ideal method for us. @Southernmapart: FIFO has been around a long time, but mostly in warehousing and accounting. It's fairly unusual for the lay person outside of these occupations to encounter it, but these racks are a perfect example of First In, First Out. "FIFO" is a new acronym for me. These are some great ideas. I have moved from a home that had lots of storage to one that has no storage. So I am always looking for storage solutions. thank you so much for the great ideas. Voted up and useful. Thank you ladies. When we built a new pantry this seemed like just the ticket and we love it. The FIFO feature is perhaps best as cans don't sit for years in the corner before finally being uncovered and used. I really like to keep my pantry and cupboards as organised as possible. We are about to renovate our pantry and I'll be sure to refer back to your hub when we do. I really like all of your ideas here for pantry storage. Pinning, Sharing and voting up. We don't have anything like this in Italy. But it makes fascinating reading and it looks so very orderly. Voting useful and up. Pinned too. It is so original to me! I've never seen these before - don't know if we get them in the UK, but they're a great idea! these are such practical solutions for maximizing storage space!! Yes, our food supply needs to be stored safely, but just as important is to use it in a reasonable amount of time. The FIFO method of can storage accomplishes this with a minimum of effort. goods that we have purchased needs to have a proper place for storing. Sometimes, we do not know what creepy insects crawling in it. Though, there are different styles of canning just to preserve food, we have to double secure these goods before it is too late. Thank you so much for sharing your hub and I will keep on reading some of your hubs. Yes, I like the FIFO very much - without it some cans almost always just get left in the back and never used. Far better a storage system that prevents that. Great ideas for pantry organization! I love the FIFO strategy- very important!! Thanks for sharing! 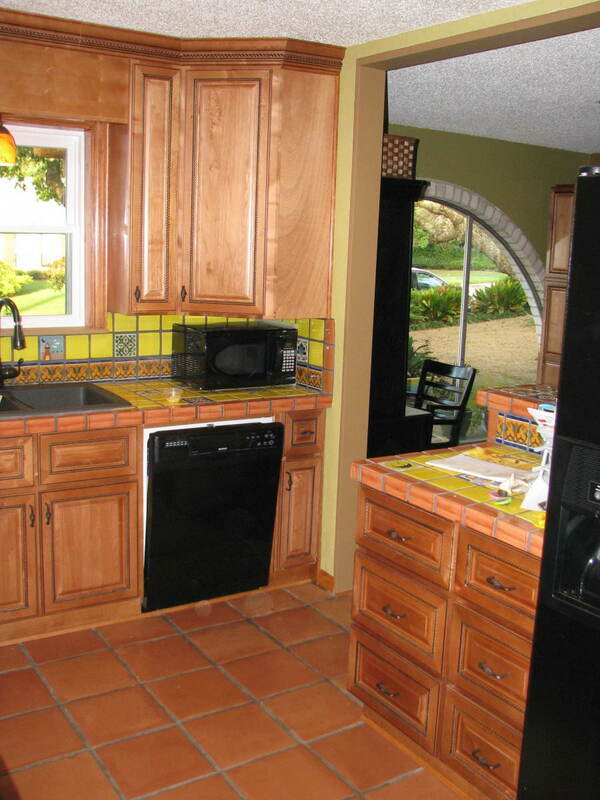 A kitchen remodel! A great project I would love to do some day but probably won't. The best I could do was to build a small pantry and fill it with storage racks. When I remodel the kitchen this year, these are on my must have list. Thank you for all the good examples of these racks. Yep - these canned food racks are great for that, especially the first in, first out type. Now that is what I am talking about, anything that makes keeping the daunting of keeping the house stocked is perfect for me. We've had one of the cansolidator types for some time now, and I really like. Cans never sit past their expiration and a quick glance shows what we need to buy to keep it stocked. I really want a canned food storage system. I never heard of them until I read this hub. It is such a great idea. Thank you for sharing this information. Great hub with some good pointers.